What Makes Cats like Boxes so Much? ← Why Do Cats like Plastic so Much? Cats like boxes enough to find ways to get underneath them when they’re upside down. Cats and boxes go together like bread and butter, to use an old cliché. If you have an empty box, and a cat, chances are you’ll find that cat in the box quite often. The fact that cats like boxes is so well known that it’s spawned memes and jokes across the Internet. What is it that cats like about boxes so much? Cats like boxes because boxes are safe and secure. First of all, we have to remember that cats need to feel safe and secure, and your cat feels safest and most secure in enclosed spaces. According to various studies put together in an article on Wired, there could be several reasons for that, but when Claudia Vinke, of Utrecht University in the Netherlands, studied shelter cats, she found that stress levels in shelter cats were significantly lower when they had boxes, compared to cats that didn’t. Vetstreet says that when cats need to sleep deeply, they’ll seek out a structure that’s reminiscent of a den. Mama cats about to give birth will do so in the safest, most secure place they can find, so their kittens are safe from predators. Then they’ll raise their kittens in that den, until they’re ready to go outside. Because of that, cats learn pretty much from birth that dens are safe. Cats like boxes because they remind them of their mama’s den. Boxes also help to trap body heat, and provide new places to explore. 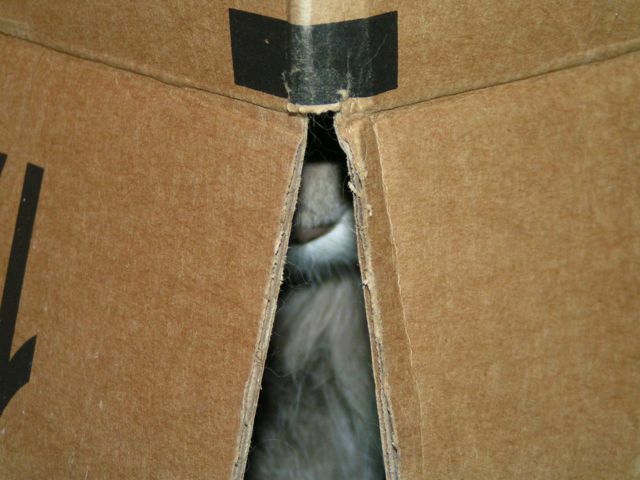 Vetstreet also says that cats like boxes because they like to be warm (what mammal doesn’t?). Small spaces trap their body heat better, making them feel warmer for much longer. Purina One has their own idea about why cats like boxes so much. They say it’s two-fold; cats are instinctively always searching out new places to hide. When you have a new box, it represents a new and interesting potential hiding place, so your cat is naturally drawn to it. Boxes, cases, cat trees, and other enclosed areas are great ways to enrich your cat’s environment and reduce any stress he may feel. Enclosed spaces are especially important when you have a multi-cat household. Cats like boxes for a variety of reasons, and will make use of them in some cute, and even hilarious, ways.